I have had it with these mf*ing snakes on this mf*ing island! I've been hard at work tonight making Irish(-ish) cheese spread and banoffee pie for St. Patrick's Day celebrations tomorrow and will be waking early to get this ready. What about everybody else? Making/doing anything fun? Yes. Yes, I have wondered that many, many times. Why do most of the Mickey Mouse related characters wear gloves? WHAT IS UNDERNEATH? A friend of mine accused me today of being the evil twin in our relationship to which I responded with this. I think it's perfectly apropos for today's buggy switchover. 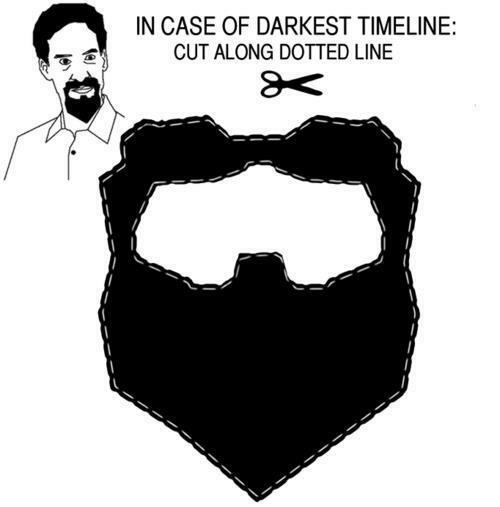 If you wanna download a Darkest Timeline Abed goatee to make your own, grab the image here. nuDeck Suggestions! I figure a lot of bitching and moaning isn't going to do anything except piss people off so I thought we could come together and make suggestions about what we'd like to see happen with it. OK, kiddies. Time to turn these frowns upside down. I've heard a rumor we're making the switch to the new system on Monday so we've got two days to revel in all that we love best about the O'Deck. So let's share 'em in a special Saturday edition of #ProcrastinationFriday. My bananas always have grumpy faces hidden in them. What are the chances this is a Fringe event? Guys, the White House has managed to both appeal to geeks everywhere and troll them at the same time. I LOVE IT! And the fact that its somehow tied to sequestration is frakking amazing. Just watched the new show Cult. It's up on Hulu before it airs in a few days on The CW. http://www.hulu.com/cult Anybody seen it yet? I wouldn't have been interested except a friend had told me about it a while back, saying she had read the original script and loved it. I just LOVE this. Hello Kitty makes everything better including elder gods. Can I post on the O'deck by adding an o'deck tag? After seeing all of those sickly sweet geek valentines floating around, I thought we could benefit from a little honesty. So, I made these. What do you guys think?